A one-stop virtual gateway to the 2010 Winter Olympics, including bios, medals won and hometowns of all the U.S. Olympians, is now online at www.olympicsin3D.com. Boulder-based EarthvisionZ created the fun, dynamic site that lets you experience the Olympics in a 3D world without ever leaving home. Fly through the city of Vancouver, see Olympic event centers, zoom down the slopes on Whistler and Cypress Mountain race courses and learn more about the completing athletes from around the world. Designed for both Vancouver visitors as well as the millions of Olympics followers around the globe, users also can check on event times, current weather, and search results by athlete or country. Tourists in the Vancouver area can look up restaurants, bars or the nearest coffee shop as well as access regional transportation, hotel information, and most relevant to travelers by car – the International Border Station wait times. With a few clicks at www.olympics3D.com, track Facebook and Twitter feeds of individual athletes from their online biographies; follow the instant, live search of social media discussions about the Olympics from the Boulder-based OneRiot search engine and even access television schedules for the entire games. EarthvisionZ has created similar sports and tourism information sites for the 2008 Beijing Summer Olympics, Sports Illustrated’s Top 100 Golf Courses You Can Play, and their own EarthgamZ site where they are currently aggregating a variety of world sports on a virtual Earth. Their sport playgrounds combine the geospatial imagery of Google Earth with the company’s patented search capabilities to assemble athlete stats and profiles, game schedules, venues, sports news, medal counts, tickets and much more on a single Web site. Users will be prompted to download the fast-loading Google Earth plug-in if they haven’t used it already. The site will be configured to be accessible to mobile phone users on their next event. The Wall Street Journal reported today that several colleges, including the University of Colorado, are protesting a new Anheuser-Busch campaign that is using college team colors on cans of Bud Light. Now I haven't actually seen one of these yet, but I presuming it's a black and gold can of beer, and I hope I find one since it appears they may quickly become collector items. The cans don't actually use the school logo, just a creative design of the colors. Now, the Federal Trade Commission has stepped in, also expressing "grave concern" that the campaign encourages underage and binge drinking on campuses. CU has worked hard to create good programs on its campus to discourage dangerous binge drinking, but having a bit huff fit about the colors on a beer can escapes me a little bit. What I really think is happening is the universities are trying to protect their lucrative licensing dollars. The WSJ reports that Collegiate Licensing Co., which represents about 200 colleges and sports organizations, said some 25 schools protested the distribution of these color beer cans near their campuses. The campaign, with 27 different color combinations, started this month and Anheuser-Busch says it simply wanted to connect with sports fans. Beer can collectors (I'm not one ... too many other collections.) will be scrambling I am sure to get all 27 color combos. And what's next -- NFL colors? Oh yeah, orange and blue Bud Lights! I see tailgate party sales soaring. 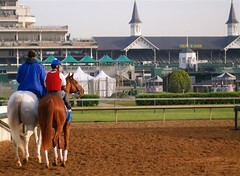 Curlin checks out morning track at Churchill Downs; Will he race against Big Brown? I've always said investing in individual stocks are a lot like going to the track, you'll pick some winners, you'll pick some losers and if you're lucky, you might break even. So with the stock market in a crisis today, I thought I'd post this photo of thoroughbred Curlin that I shot earlier this spring right after the Kentucky Derby. The photo has gotten quite a few looks on my Flickr page, and now there is a potential showdown between Curlin and Big Brown in the Breeders' Cup Classic on Oct. 25. Curlin's next race is the Jockey Club Gold Cup at Belmont on Sept. 27. I was lucky to get a few photos of Curlin, with his trainer Steve Rasmussen taking him out for a morning run at Churchill Downs. It was a beautiful morning, and a friend had a pass for the back stretch. As my friend sought out some autographs of the well-known trainers, I shot photos. You can see more on my Flickr page, under my Kentucky set of photos. Big Brown was in his stable that morning after his Derby win, and I would love to see a showdown on these two classic horses. It could be the race of the year. It's just a few days after the Derby, and of course all of the talk is about the "triumph and tragedy" of this year's race. I'm in Louisville and got the chance to walk around on the back side of Churchill Downs, where life goes on readying for the next race day. This was the Tuesday after the Derby, and with no races that day, trainers were working out their horses. These horses get amazing attention from their handlers, with a nice bath in the early morning hours. They're beautiful animals, they are bred to race and although there will be more debating about synthetic tracks, etc., there's no doubt the sport will continue and hopefully, fewer accidents like the one on Derby Day will take place. A longtime Boulder entrepreneurial publishing company, Inside Communications, Inc (ICI), the parent company of VeloNews, Inside Triathlon, VeloPress, VeloGear, VeloSwap and their Web sites, is telling their own story online of how they got started in 1986 with an idea over dinner at a trade show. The company recently agreed to be purchased by the Competitor Group, which publishes Competitor and Triathlete magazines. Competitor Group is owned by Falconhead Capital, a New York private equity firm. The story presents an inside look at how the company literally rode the wave of the popularity of bicycling and bike racing, and, of course, what better place to do that than the bicycling capital of the world, Boulder, Colorado. The story is written by John Wilcockson, one of the founders of the first magazine called Inside Cycling with Susan Eastman and Felix Magowan. Boulder gets a lot of attention for many things, including biking, climbing, natural foods, tech entrepreneurs, to name a few, but what is not always mentioned is how the city also has been a very strong arena for several successful and entrepreneurial publishing and event companies, including Inside Communications; New Hope Media (sold to Penton); Nexus Publishing (a holistic health and spirituality journal); SKI and Skiing magazines, (both owned by Bonnier Corporation, which also operates Warren Miller films) and a large number of newspaper and magazine publishers in a relatively small market. We kept a database of publishers at Boulder County Business Report, sold earlier this year to Cincinatti-based Brown Publishing, and at last count, there were about 23 newspapers of all sizes just in the Boulder Valley area. And that does not count several free circulation magazines such as Elephant Journal, with a New Age and yoga niche, and Boulder Magazine, published by Brock Publishing. You'll also find niche trade magazines, such as Solar Today, published by the Boulder-based American Solar Energy Society. Having run the Business Report for years, I had many good employees recruited away to other local publishing companies, but I also recruited several staffers to our papers from their ranks. As always, it's a fairly small world in Boulder, and publishers keep tabs on one another. Fortunately, the city is a magnet for talented writers, photographers and designers, many willing to leave the larger city markets for the quality of life Boulder offers. Recently my friend Jim, my yellow lab Santo and I had one of our better days pheasant hunting in Nebraska in years. We drove out, with a light snow falling but a forecast of a cold but sunny weekend, perfect conditions for a good hunt. We woke up to a cold Saturday morning, but with fresh snow covering the fields as well as all the back roads we'd be driving to hunting spots. Cold weather and a good snow huddles up the pheasants, and with all of Nebraska's corn crop finally in, we expected a pretty good day. We drove carefully all day, staying in 4-wheel drive and usually making our own tracks on gravel roads where even the local farmers had not yet ventured. We navigated around a few big hills that looked like a good way to get stuck, and in a full day of hunting, we saw a total of one other group of hunters, who probably were scouting for the black-powder deer season. What's happened to the bird hunters? We hunted just east of McCook, a town that years ago attracted pheasant hunters in droves. But these days, just about any time past opening weekend and you've got nearly everywhere to yourself. A few reasons seem obvious. First, younger people just aren't hunting much anymore. The only hunters I know these days are us gray-beards, still longing for those crisp mornings and the thrill of watching your dog flush a rooster for an easy shot. Access, yes, is more difficult. A lot more land is privately leased, so you've got to work to get permission to hunt. We've been lucky the past few years, paying some Nebraska land owners a small daily fee to hunt several of their properties. We'd knock on doors if we had to, but this arrangement has been easier. Training a good bird dog is a lot of work, too, not something most of your city dwellers really seem to give a big hoot about. My lab is now almost eight, and it's only in the past two seasons that he's settled down into a mature bird dog. Unlike nearly every hunter I know, I refused to use any kind of electronic shock to train him. When he was younger, and ran too far out ahead, he just got a stern shout and maybe a slap on his haunts. I understand the idea of shock collars, which trainers will tell you really don't hurt the animal. But if someone was buzzing my neck every time I missed a shot, I wouldn't love the sport very much would I? Upland bird hunting is a lot of walking -- and while I can seldom drag myself into a gym, taking good long walks with my lab and then hunting slowly, preferably in a small group of just two to three other hunters, is exercise I enjoy. I carry a small digital camera, pausing now and then for photos of old windmills, deserted barns and, of course, the desired retrieve of your dog running back with a bird in his mouth. Once home, a grilled pheasant breast -- or maybe a bird stuffed with oranges and wrapped in bacon, then baked slowly to keep it juicey -- is a treat few people except us hunters get to savor. I haven't had any time the past few years for waterfowl hunting for ducks and geese, but sitting in cold blinds has lost its appeal a bit. Maybe next year. Give me the wide open spaces of Nebraska or Kansas, the good company of a few friends, the excitement of an unexpected flush of quail in a wooded area and the pride when your lab finds the downed bird buried deep in some heavy cover no man could ever reach into. Walking into the hunting department of a Cabella's or other sports store, and you'd think hunting is a crowded sport. But head out in late December or early January, and you'll count the number of trucks you see with dog carriers on one hand. Fewer hunters actually isn't a bad thing -- it just means a few more pheasants for me and my lab.